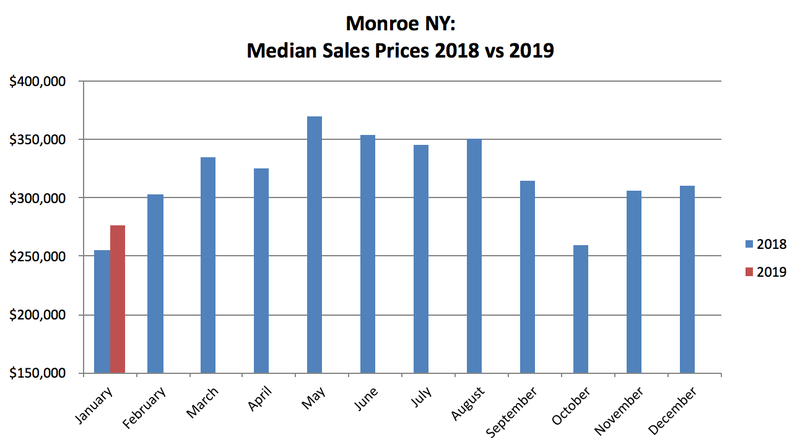 The Monroe, NY real estate results are available for January 2019. The number of monthly sales increased over the last month, while available inventory decreased. Sales prices also decreased. Based on current inventory levels, Monroe is on the cusp of becoming a seller’s market. Following is an overview of the January 2019 Monroe NY results. In the month of January 2019, there were 22 single family home sales. This number was nearly double the December 2018 results. And it was exactly double the same time last year. So Monroe NY homes are definitely selling. There are also 38 homes currently under contract with nearly 20 of those going under contract last year. I expect those to be closing soon. Those sales will probably show up in the February results. In terms of inventory, at the end of December 2018 there were 102 homes on the market while at the end of January there were only 88, a decrease of 14%. At the end of January a year ago, there were only 66 homes on the market, which was a seller’s market. We’re nearly at a seller’s market now, but my expectation is that more homes will come on the market as we get closer to Spring. The median sales price for January 2019 was $276,750, a decrease of about 11% over December 2018, but a 9% increase over the same time last year. The seven lowest priced sales included five foreclosures, a short sale, and cash-only as-is sale. Without them, the median would have been $305K, right on par with December. As inventory shrinks, more of the distressed-type properties are purchased because choices are slimmer. It’s not surprising to see median prices decline somewhat at this time. It remains a great time to sell, especially because the inventory has decreased and buyers need more choices. If you are a seller and want to put your home on the market, let’s do it. Soon the Spring market will be in full swing and the competition will heat up! If you are a buyer, there are still some opportunities but it’s important to be ready to make an offer as soon as you find “the” house. The best way to ensure you’re ready is to talk to a real estate professional. I’m happy to help if you are in Orange or Rockland Counties!